Illustration by Yan Liang, via MIT News. Our bones are remarkable feats of engineering; strong and yet light, shot through with holes and yet able to bear incredible loads. This super-strong natural material is built as cells incorporate hard minerals like calcium into living tissue. The MIT team, led by assistant professor of electrical engineering and biological engineering Timothy Lu, was inspired by this interplay of living cells with nonliving components. The process Lu and his team used begins with the bacteria E. coli and genetic engineering. They chose E. coli because it naturally produces thin, slimy films that adhere to surfaces — it’s this adhesion that’s key. In order to adhere to surfaces, E. coli produces “curli fibers”, comprised of repeating protein chains. 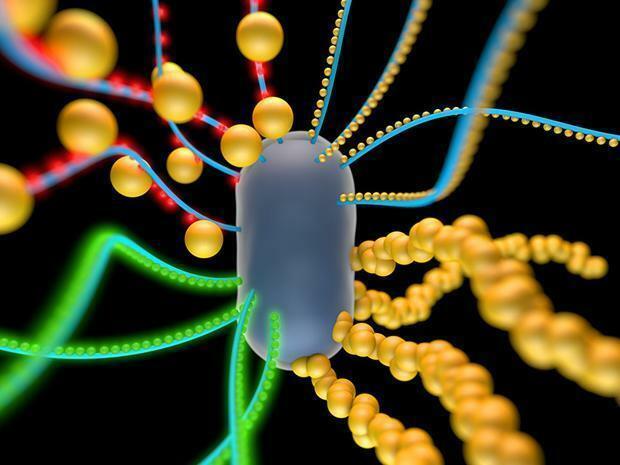 The MIT team replaced the bacteria’s ability to produce curli fibers with an engineered genetic circuit that only produces curli fibers if given a certain molecule. Now the team essentially has an on-off switch for the bacteria and can control the formation of biofilms: supply the bacteria with the trigger molecule and they produce curli fibers and form biofilms. On top of this, the team engineered another set of E. coli with a similar on-off switch but based on a different molecular trigger. And these bacteria were modified one step further: researchers altered the genes coding for the creation of curli fibers so that the protein chains would grab on to gold nanoparticles. So they had two varieties of engineered bacteria, both controllable via distinct molecule of their choosing, and one of the two’s ability to latch onto its environment with curli fibers has been co-opted to make the bacteria gather tiny bits of gold from its environment. Take both varieties, grow them together; manage their growth relative to one another with the two on-off molecules; and supply some nanoscale bits of gold. The researchers did just this and managed to coax the bacteria to build a tiny film laced through with gold nanowires: a conductive surface comprised of living cells. And the conductive biofilm is just one of several proofs-of-concept to come out of this project. The team was also able to embed quantum dots — semiconductor nanoparticles that glow a particular color after being illuminated by light — in their biofilm through a similar technique. The final success lies in getting their modified cells to communicate with one another, as emphasized by the Christian Science Monitor. The molecular “on-off switches” described above don’t necessarily need to be supplied manually; in fact the researchers produced a third variety of E. coli which naturally produced the chemical trigger, activating the generation of gold-locking curli fibers in the second variety. This latest breakthrough is sure to be one of many similar efforts that blurs the perceived boundaries between living and nonliving, artificial and organic. We’re increasingly able, as Lu and his team demonstrate, to manipulate our world at the level of molecules and atoms — whether those are DNA molecules or gold nanowiring.